High School Genes Review. Periods are not a pleasant thing but women have to learn to live with them on a monthly basis from puberty onwards. The female period is controlled by hormones and can cause a lot lot of unpleasant symptoms including swollen breasts, acne, and bloating. Fortunately the problem goes away after menopause, but the hormonal changes that take away the need to bleed also present other issues and can retard the metabolism sufficiently to cause weight gain. High School Genes is a dietary supplement designed to rectify this problem, get the metabolism back on track and help rid the body of excess fat. Who Makes High School Genes? 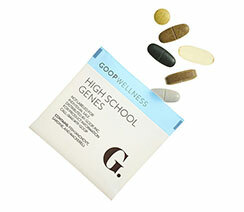 High School Genes is made by Goop and marketed as part of the Goop Wellness range of products. The company was founded by the actress Gwyneth Paltrow and has been trading since 2008. A few of the company’s other lines include Goop clothing, bags, shoes, and accessories. There are even Goop fragrances and beauty products. Needles to say, Paltrow is not qualified to formulate fragrances and beauty creams etc., so she needed to recruit some expert help. The Goop Wellness products are designed by doctors and the doctor who created High School Genes, Sara Gottfried, M.D, is a recognized hormone expert. What Kind of Supplement is High School Genes? High School Genes consists of five tablets and a capsule that are intended to be taken together. Only one (6-pill) dose is required each day and there is no need for fiddling with several bottles or boxes because the pills are packaged into handy little single dose envelopes. The Goop website does not provide any information about the roles each pill is expected to play but guessing the function of the Metabolism Boost tablets is hardly rocket science. The Free Radical Scavenger tablet probably contains antioxidants that can rid the body of toxins, and the Gut Balance tablet may be intended to provide a detox. As for the rest, we cannot really say. Is High School Genes Suitable For All Women? One of the ingredients is Rhubarb. It’s good for keeping people regular, but its use may lead to abdominal crams and diarrhoea. High School Genes also contains taurine and caffeine. Both can clear the mind and boost energy levels, but their presence could be a problem for anyone who does not tolerate stimulants well. High School Genes is not a good option for women who are pregnant or nursing a child. Women who have existing health problems, or are using medicines, should get a doctor’s advice before they commence supplementation. Usage Instructions – The six pills are taken with water in the traditional way, but some women will not be used to taking so many pills together or in close succession. There are a lot of vitamins and minerals, often in very high doses that far exceed the recommended daily amount. The product also provides Omega 3 fatty acids and numerous plant extracts, including watercress, Chinese cinnamon, green tea, and several fruit extracts. Some of the fruit extract, including blueberry, may provide antioxidants that will help purge the body of free-radical toxins. And the B Vitamins provided should help boost the metabolism and improve cellular health. 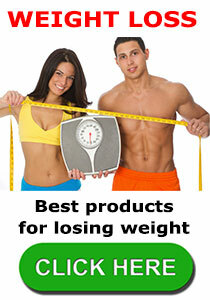 Green tea is a proven fat burner and there is also some zinc and Iodine. Both these minerals have roles to play in hormone production, so their presence is appropriate for a product that is intended to manipulate hormone levels. However, these are just a few of the ingredients. There are around 50 in total and it is not possible to predict how such large combination of ingredients is likely to perform when grouped together in this way. High School Genes is a reasonably expensive product. Customers who buy it are looking at paying $75 (£57.50) to $90 (£69) per month, depending on whether they opt to buy as a one-off transaction or purchase via auto-ship. The latter is the cheapest option. It’s also worth taking note of the fact that Goop does not offer a money back guarantee. Where Can I Buy High School Genes? 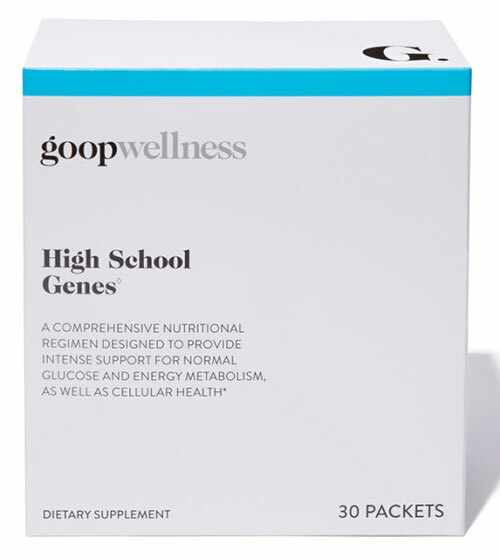 You can only buy High School Genes if you are based in the USA because Goop has stopped providing international shipping options and the official website is the only place to go. Will the Product Do the Things it’s Supposed to Do? Menopausal women have a lot of adjusting to do and it is possible that some of the ingredients provided by High School Genes may help ease the transition period. The presence of green tea and some of the other ingredients may boost the metabolism and encourage the body to start burning fat instead of storing it. There is no proof that this six-pill combo will work though, and some of the vitamin inclusion rates are high enough to be concerning. 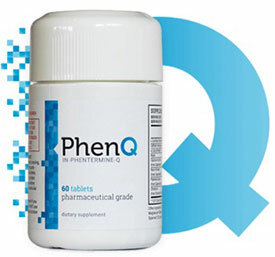 If you are reading this because you are looking for a way to lose excess weight, we suggest you buy PhenQ instead. The product has far fewer ingredients, but all of them have proven value. It is also much cheaper and comes with a 60-day money back guarantee. This entry was posted in Diet Products and tagged Goop Canada, High School Genes Canada, High School Genes CVS, High School Genes Publix, High School Genes Walmart by admin. Bookmark the permalink.